If you were blindfolded and dropped off in Lusaka, Zambia, you might mistakenly imagine yourself in a suburb of Johannesburg or Cape Town,’ says Grieve Chelwa, senior lecturer in economics at UCT’s Graduate School of Business (GSB). ‘South Africa’s economic influence is felt so strongly in Zambia that it’s changing the local character – and I suspect it’s similar in other countries within SADC. ‘Go to any supermarket in Zambia and you’ll be greeted by shelves full of South African brands. The shopping malls are populated by South African companies, and everywhere are branches of big South African banks.’ The Trade Law Centre (Tralac) names Zambia as one of the main destination markets for SA’s intra-African exports, with the others being direct neighbours Botswana, Namibia, Mozambique and Zimbabwe. The latest private-sector investments in the region were announced in August 2018, when SA handed the SADC chair to Namibia during the regional body’s annual Summit of Heads of State and Government, held in Windhoek. ‘Over the period of our chairship, we have been able to secure more than $500 million of committed productive investments by South African companies in each of the priority value chains across the region,’ President Cyril Ramaphosa said in his keynote address at the summit. Summing up the nation’s 12-month tenure, he noted that the ‘investments cover forestry, agriculture and agro-processing, fertilisers, mining and mineral processing, and pharmaceuticals’. Stronger RVCs will assist in narrowing the trade and investment disparities that are still heavily skewed in favour of SA. According to a recent report on SADC’s regional economic development by the South African Institute of International Affairs (SAIIA), SA had a $14 billion trade surplus in 2017 – far greater than any other SADC state. Angola recorded the next largest surplus ($0.76 billion), followed by the DRC ($0.48 billion), Mauritius ($0.03 billion) and eSwatini ($0.01 billion). The publication doesn’t yet incorporate the Comoros – the French-speaking archipelago between northern Mozambique and Madagascar, which is part of the Common Market for Eastern and Southern Africa (COMESA) and only joined SADC at the 2018 Windhoek Summit. 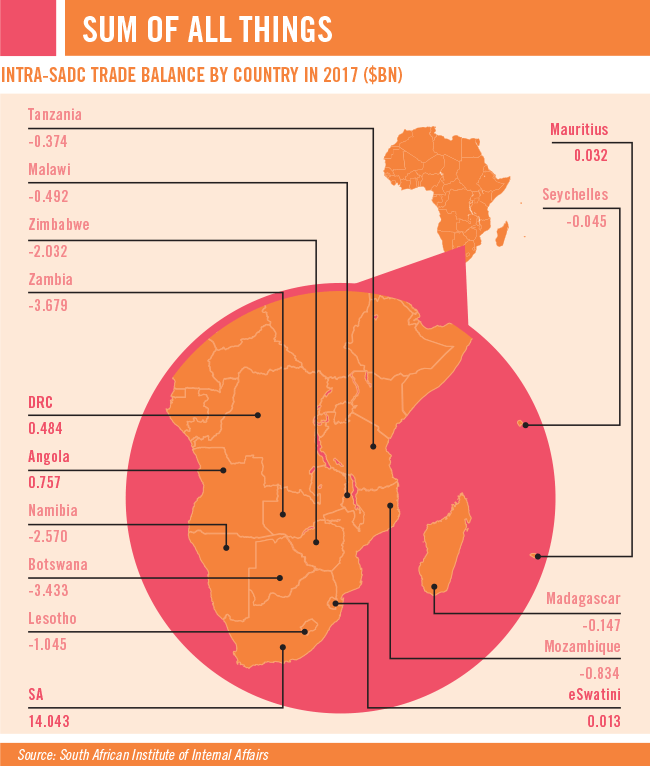 ‘Among SADC’s 15 [now 16] countries, five recorded a trade surplus with their SADC counterparts in 2017, of which 10 were net importers,’ states SAIIA. ‘These figures illustrate that trade within the regional economic community is remarkably skewed, rendering smaller economies dependent on South Africa for imports of higher-value goods and services.’ The authors explain that this has been called the ‘triangular pattern’ of SA trade – where the country runs a trade surplus with SADC and a trade deficit with the rest of the world, which effectively turns it into the gateway for global products entering the SADC market. 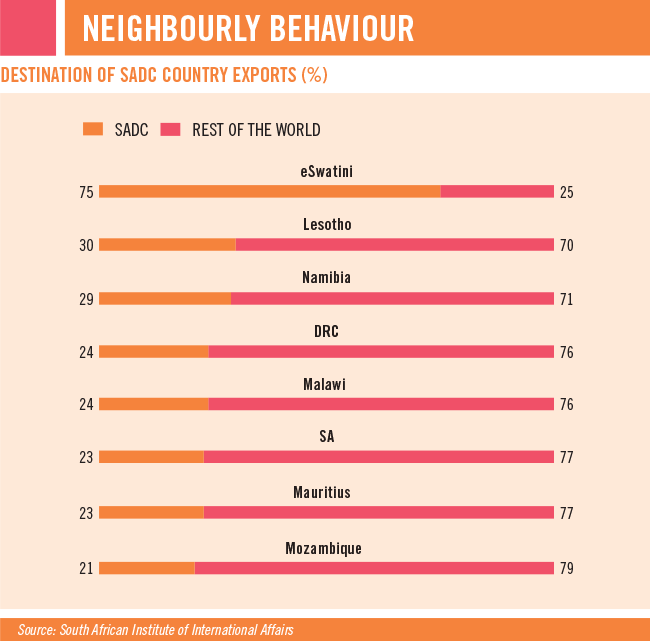 There are also ‘stark’ differences in export volume among SADC members, according to the SAIIA research. SA accounted for almost 67% of total intra-regional exports in 2017, compared to a mere 6% for the next largest exporter, DRC. 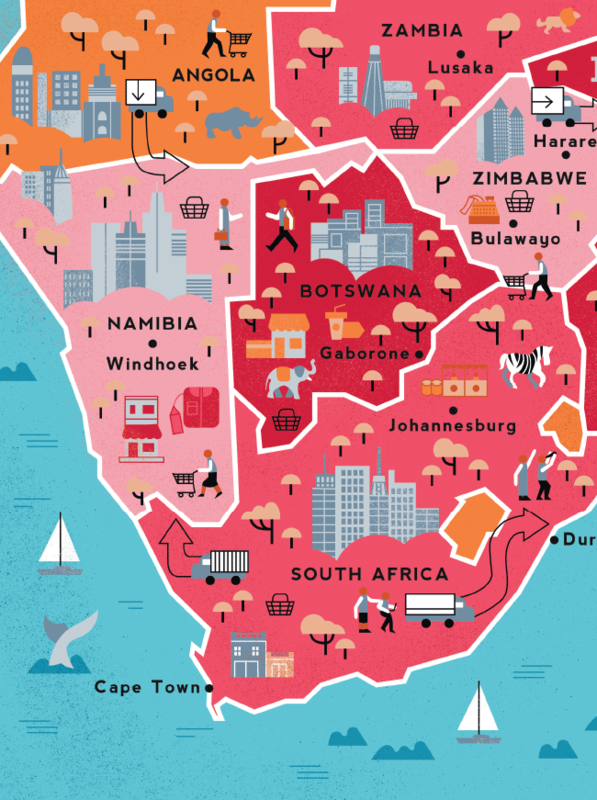 ‘This disparity highlights how South Africa’s economy sets itself apart from the rest of the region by attracting large industries with its sizeable market. Owing to its larger economic base, it has been able to benefit from economies of scale to enable exports, in contrast to smaller economies in SADC,’ states the report. Statistics on this topic can be found in the Labour Research Service (LRS) database, which, since 2008, has tracked 91 SA multinational corporations (MNCs) operating across the continent – providing information on companies’ finances, operations, geographical spread and remuneration policies. Zambia, eSwatini, Namibia, Mozambique, Lesotho and Botswana are the countries hosting the highest number of sampled companies. According to LRS’ MNC Trend Report, the following SA companies achieved high returns in Africa during 2016: Pretoria Portland Cement (PPC) reported African sales at 30% above the calculated average, followed by Group Five (28%), Barclays Africa Group (24%), Tsogo Sun (20%) and Shoprite (19%). Around 78% of produce stocked in this supermarket is locally sourced, in line with attempts to use more local suppliers. However, if this applies only to agricultural produce and not to the retailer’s other goods and services, it will not be enough to stimulate regional value chains, which are paramount for long-term sustainability. However, SADC is already making progress in its harmonisation efforts. For example, its regional electronic settlement system is building a platform for increased intra-SADC trade and investment. The roam-like-at-home initiative is developing a harmonised cost model for cellular roaming tariffs, while the objective of the Medicines Regulatory Harmonisation project is to strengthen public health networks and eventually also pharmaceutical RVCs. Ultimately SA, as the largest player, is not wielding all the power in the regional bloc, as other members exert ‘soft power’ through their diplomatic or cultural influence, according to the Institute for Security Studies. The use of regional ‘champions’ or ‘locomotives’ could drive certain cross-cutting issues ahead. For example, the institute considers Namibia a champion of gender mainstreaming, and refers to Mauritius as a champion of ‘productive competitiveness’. Once member states are allowed to combine their cultural, political and economic strengths, the entire regional economic community is set to benefit.